Back row, from left: Jaqueesha Monique, Hayley Flores Jasmine Brown, Brianna McDevitt, Casey Slade, Liz Sullivan, Front row, from left: Lucas Hayden, Tom Vanichachiva. 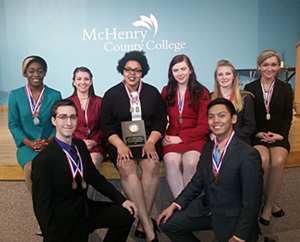 MCC students placed in two Open Finals: 6th Place Duo Interpretation - Steve Guardi and Jeffrey Vitale and Steve Guardi placed 5th in Prose Interpretation. Both MCC debaters were recognized in Parliamentary Debate for Individual Speaker Awards: 4th Place Speaker - Carl Mohr and 6th Place Speaker - Richard Singletary. 2011 College of DuPage Frank-ly Speaking invitational tournament: Team captain Kat Stemple took first place and Steve Guardi of Johnsburg placed second in prose interpretation. Lauryn Lugo won a Gold Award for Dramatic Interpretation; Joe Cusumano and Katie Klein each won a Bronze Award for Informative Speaking. Winners of the bronze award as a team for Individual Events Team Sweepstakes are: Joe Cusumano, Branden Dunlap, Katie Klein, Lauryn Lugo, Mike Tarchenski, and Alex Peters.